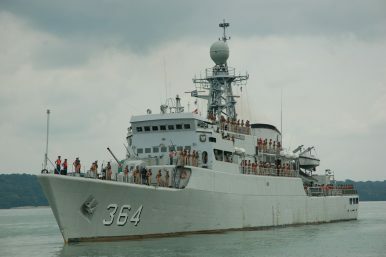 A ship from the Indonesian Navy. Jakarta continues to add to its capabilities in spite of the challenges that remain. Late last month, Indonesia reportedly finalized a new order for fast attack craft that had been earlier mulled. The deal spotlighted Jakarta’s continuing efforts to boost its maritime capabilities despite the challenges that remain. As I have noted before in these pages, Indonesia has long been engaged in an effort to strengthen the country’s maritime capabilities in recognition of the sobering reality that it needs more vessels and aircraft to fully monitor what is the world’s second longest coastline. That priority has continued on under Indonesian President Joko “Jokowi” Widodo, with a focus on aspects such as boosting the country’s nascent but growing defense industry. One aspect of that modernization is the procurement of fast attack craft of various kinds, including KCR-60M, built with the help of Indonesian state-owned shipbuilder PT PAL. Indonesian officials had previously said that these fast attack craft would constitute a boost for the country’s capabilities, with their speed and lethality making them useful across a range of functions including for archipelagic warfare. The Indonesian Navy currently operates three KCR-60M vessels commissioned back in 2014, with a fourth vessel expected to be delivered following its launch in February 2018. There were also indications that PT PAL’s work for the Indonesian military would continue to increase into 2018 and beyond, including up to four additional KCR-60 fast attack craft following the ones it had already produced. Last week, this aspect of Indonesia’s naval modernization plans was in the spotlight with further confirmation and details disclosed about the additional order for fast attack craft. In late December, a contract was reportedly signed at the defense ministry for the order of four more KCR-60M-classs fast attack craft. A senior official from PT PAL confirmed to IHS Jane’s that the contract, worth 2,800 trillion rupiah ($195 million) was for the vessels to be constructed by PT PAL at its facilities in Surabaya, with construction work in the ‘fitted-for-but-not-with’ (FFBNW) configuration for all the vessels’ combat effectors including weapons, sensors, and countermeasures systems. The defense ministry is expected to issue separate contracts for these systems at a later date. Few additional details have been disclosed about the vessels and the new deal, though indications are that the first of the new vessels are expected to be delivered starting in 2021. And Indonesian officials themselves have rightly cautioned that despite such incremental inroads, the country still need much more in order to just meet the naval requirements initially set out in its modernization plans. Nonetheless, Jakarta’s efforts to do what it can on this front nonetheless remains interesting to watch in 2019 and into subsequent years as well. The Southeast Asian state continues to make incremental progress in its efforts amid lingering challenges. Exercise Komodo 2018 Puts Indonesia Navy in the SpotlightIndonesia Launches New PC-40 WarshipIndonesia Gets First SIGMA 10514 WarshipIndonesia: A New Shipbuilding 'Magnet' from ASEAN to Africa?What’s in the New Indonesia South China Sea Base Hype?